Jeppesen Instrument/Commercial Training Kits developed for the FAR Part and FAR Part 141 training programs are the most complete Instrument/Commercial training packages available. 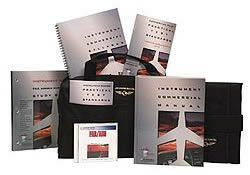 Instrument/Commercial Part 141 Kit is developed for the FAR Part 141 training program. This kit contains all the essential training products used to prepare students for the written and practical examinations and the FAR Part 141 tracking and quizzing products.